What’s the best portable generator? That depends on what you need. Hurricane season is right around the corner and camping season is well underway. If you’re a contractor, you have an entirely different set of needs. We have our top picks across each level of portable generator from the 2000-watt class all the way up to 8000 watts. We’ll let you know what the best uses are at each level and why we picked the model we did. Editor’s Note: This article orginally published on May 28, 2018. Ryobi is well-known for offering a lot of bang for your buck. With this $599 generator, you get some added convenience with a Bluetooth connection to your smartphone that gives you fuel monitoring (fuel level, remaining runtime at current load), current power consumption, and reset ability using the Ryobi GenControl app. You can access the same features on the LCD screen if you don’t want to use your phone. This model falls into the class of quiet generators and you can expect between 57 dB(A) at 25% load and 67.9 dB(A) at 100% load. At a 50% load (900 watts), you can expect to get around 7-1/2 hours of runtime from the 2.1-gallon tank – making it an excellent option for camping and tailgating. For job site use, you’ll be limited to roughly 13-amp tools, so there’s no reason to include a 240V outlet on this model. Pro Tip: Quiet doesn’t mean safe for use indoors, so be sure to only run gas/diesel generators outside where there’s plenty of ventilation. When you’re ready to take your recreation a little more seriously, consider the Energizer eZV3200P to give you more power than the 2000-watt class. You’re still reasonably portable for camping and tailgating, but the extra power moves you into what you need to for your weekend hunting trip and RVing. 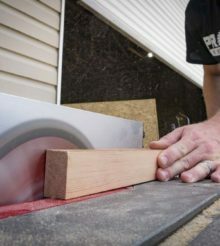 For the job site, you’ll be able to power your 15-amp tools – like table saws and miter saws – though you are limited to using just one tool at a time. One of the really convenient features on this model is the electric start with remote control. From up to 100′ away, you can start it up without getting out of your camp chair or setting your root beer down. There’s also an RV ready option with a 120V, 23.3A RV connection onboard. The Energizer runs even quieter than Ryobi, producing just 60 dB(A) at 100% load. The fuel capacity is just 1.95 gallons and will give you just under 4 hours of runtime at 100% load (2800 watts) or 15-1/2 hours at 25% load (700 watts). There’s a reason Honda has such an incredible reputation in the generator sector and the EB4000 is another good example. With 4000 running watts and 5000 starting watts, you can run any of your job site tools, including 240V tools like welders. The 185-pounds weight moves you away from camping and tailgating applications and is better suited for running power for the hunting camp or providing emergency storm power to keep your food from spoiling and run lights, fans, or even a window AC unit. What also makes it an attractive middle wattage ground is the excellent runtime – 16 hours at 50% load (2000 watts) or just over 10 hours at 100% load (4000 watts). If you need more reasons to love it, you move up to selectable 120V/240V plug, you get a 30A outlet, and it only produces 63 dB(A) at 100% load. If there’s a downside, it’s that there’s no electric start on this model. There aren’t any USB ports, but you’re moving from small inverter generators to a more professional class and it’s to be expected. When you want longer runtime and engine life, you turn away from gas and look towards diesel. Generac’s XD5000E takes advantage of a Yanmar LW series 435cc diesel engine that can run for more than 32 hours at 50% load (2500 watts) on its 12-gallon fuel tank. That makes it easily the tops on our best portable generator list for situations where running for long periods of time is high on your priority list. By the time you hit 5000 watts, you expect 240V access and you get it along with both 20A and 30A 120V outlets. With those 5000 watts, you can expect to run just about anything on the job site along with covering most any household appliances you’ll want to use when the power goes out. It’s a great unit for powering the hunting camp as well. An electric start is nice to have, but you’ll need to buy the battery separately. The same goes for the wheel/handle kit – something you really want to factor into the price considering it weighs in at more than 250 pounds. Diesel Power requires less maintenance, is more efficient, and provides a long life. Yanmar LW Series 435cc air-cooled direct injection, EPA Tie IV, industrial engine. Less than 6% total harmonic distortion for clean, smooth, operation of sensitive electronics, tools, and applications. Large-capacity 12-gallon fuel tank with fuel gauge provides a long run-time of 32.4 hours at 50% load. Compression release lever provides easier starting during cold ambient temperatures. Low Oil Pressure Shutdown automatically safeguards engine from damage. Fuel primer bulb provides quicker starts when the fuel tank has previously run empty. Durable, fully welded 1-1/4″ steel frame. Integrated lifting eye provides easy transport and security on the job site. Single touch electric start provides hassle-free start-up (battery not included). If you’re looking for big power output without breaking the bank, Ridgid has your model. It’s the best portable generator for less than $1000 and gives you 6800 running watts with 8500 starting watts. Ryobi has a 7000-watt model that comes in a close second. You get just about everything you want in a portable generator – electric starting, GFCI protection, 240V access, and a transport system that works even on tougher job site terrain. On the job site, expect it to run just about any tool you want with the capacity for multiple tools to run at one time – including table saws and miter saws. For emergency storm power or powering a hunting camp, you’re moving into a power class that will let you run some significant appliances. Think a refrigerator, small window AC unit, lights, fans, TV, computer – all at one time. Just keep an eye on those starting watt requirements. Pro Tip: If you’re not sure how many starting watts something needs, running watts x 3 is a good estimate. The only thing holding Ridgid back slightly is that it could use a bigger gas tank. 9-1/2 hours is a good amount of runtime on the 7-gallon tank at 50% load (3400 watts) – good enough for a full day on the job site. However, moving up to 10 or 12 gallons really helps for emergency power needs. Editor’s Note: So we said all those nice things about this generator just in time for Home Depot to pull it off their website. Is another model coming out soon to replace it? We’ll have to see. In the meantime, check out Ryobi’s 7000-watt generator with electric start and EFI for less than $1000! When you need all the power you can get and still call your generator “portable”, the Briggs & Stratton Elite Series offers 8000 running and 10,000 starting watts without draining your savings account completely. The key features are all here – electric starting, GFCI protection, a 240V outlet, and the wheel kit is solid enough to cover job site terrain. There’s also the added security of a keyed electric start system to make sure no one runs the generator unless you want them to. Similar to Ridgid, 9 hours of runtime at a 50% load (4000 watts) will get you through a full workday. Again, it’s the emergency power and remote cabin situations that beg for a bigger fuel tank. With enough watts to power the majority of your creature comforts, the only thing lacking is more time between refuelings. Pro Tip: While 8000 watts won’t cover your entire house, it will run most things on its own. If you’re going to wire directly into your breaker, hire a licensed electrician to do the work. For $1300, Briggs & Stratton offers a solid value for this level of power output. The only question I have left is whether we’ll see a more premium model with one of the new Vanguard engines down the road. Good read and thank you for your review. How about a dual fuel generator review? Wrong! The Harbor Freight “Predator “ series generator is best by far!